hi guy this currently a project im doin for someone . 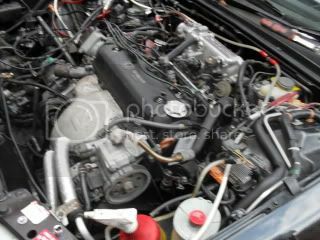 the car, a cb7 jdm coupe manufactured in the usa for japan . its very rare and special indeed .ive never come across cb accords in black and this one comes also with a bose stereo system . i was told by the guyz from cb7tuner which im also a member of that this car is a SE spec . however let me not bore you. ok, so here is what it look like when i got it . 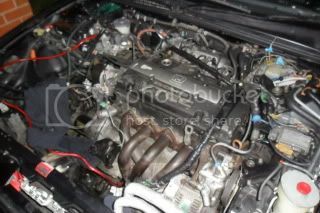 standard f22b sohc auto . just have few more thing to do then i take it for a test drive . Ah excellent! Make this the swap thread then, step by step with lots of pics!! 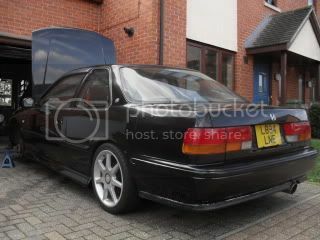 36mpg -- 200bhp -- 8000rpm -- 4 doors -- Honda = Perfect mix. 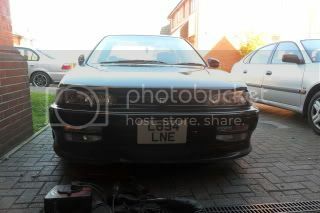 My Main 4th gen Page JDM H22A swap finally done! looks like a great job. how many hours did the swap take? Lloydie that looks fantasic, and I'm sure I've seen that car around but possibly with different wheels.. either way it's gonna be a stunner when done. Definitley interested in more pictures and info on this one. Also this black one is in Bradford, so Fahad and Bradford dwellers keep your eyes peeled for a super speedy 4th gen.
That's the next thing on my of things to do! How's it run...bet its quick! Looks very good! What are your next mods you are gonna to do? Bisimoto Engineering, Where Efficiency Meets Technological Perfection! You could send me some Cams to trial out also? ?